One of the reasons I like making earrings is the oh-so-quick results. Well, “quick” compared to the hours and sometimes days it often takes me to design and finish a necklace. I’ve been working on some bigger pieces lately, hit a bump in the process, so decided earrings would ease the frustration. Categories: Earrings | Tags: new, repurposed, wire | Permalink. Old jewelry often finds its way into thrift stores and yard sales. It’s like a small tarnished treasure, waiting to be rediscovered. I made each of these from left-behinds — pieces that no one was interested in anymore. I love the hunt! You have to look beyond the missing pearl, the broken clasp, the twisted chain and ask yourself What if …? I’ve found some beautiful necklace clasps that outshine (no pun intended) many of the versions available today. Even covered in grime the workmanship is evident. A little gentle Ivory dishwashing soap, some warm water and voila! Its beauty is suddenly apparent. Categories: Earrings, Necklaces | Tags: repurposed, thrift store | Permalink. A trip to a thrift store is like a treasure hunt. I never know what I’m going to find. Which makes it even more fun. I was out at the Coast last week and spent several happy hours browsing through leftovers, give-aways and no longer wanted items. At one store I found these Alaska Black Diamond earrings. Like the Ugly Duckling they didn’t look very appealing. They were long and heavy and clunky. Ah, but that’s the challenge — could I design something more appealing? Sometimes I buy old jewelry just for the components. This time I knew exactly what I wanted to do with the focal beads. I brought the earrings home and carefully took them apart. Then I washed and dried everything. The beads were strung on wire in the original design — I chose a balled head pin instead. The bugle beads added clutter so I set them aside. I topped each “vase” with the original round bead. The French ear wires added additional length to the original design, making it even more awkward. I opted for post-and-ball findings, to echo the round bead and smooth curves of the focals. Categories: Earrings | Tags: repurposed, thrift store | Permalink. Categories: Earrings | Tags: repurposed | Permalink. Thrift stores are one of my favourite places. I almost always find something unusual when I visit one. An afternoon browse through one in Sidney, BC last summer turned up an interesting brooch. It said “steampunk” as soon as I saw it. It was languishing underneath some other prettier pieces, forgotten by most. Lucky me! I brought it home and left it on my workbench. Time passed. A month or so later I took it apart — it had several pieces attached to it giving it a bulky look. I took them all off and began playing with possibilities. Nothing worked. So I set it aside again. A couple of weeks ago I dug it out and draped some chain around it. Aha! I found my design. 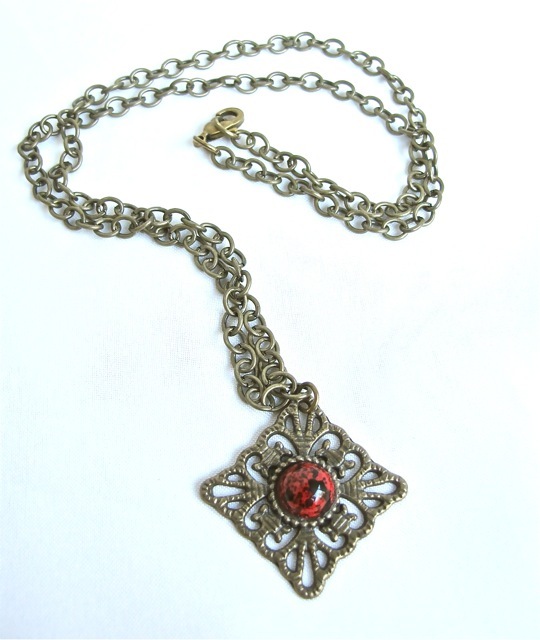 Categories: Necklaces | Tags: repurposed, vintage | Permalink. Step aside, Sol. Move over dandelions. The woman has discovered yellow. And who’da thunk it would be so much fun. Whoo-hoo! Don’t know what I was thinking before but it never occurred to me to actually use yellow. I mean I know somebody must have been cause they make yellow beads, right? But it weren’t me. Until now. 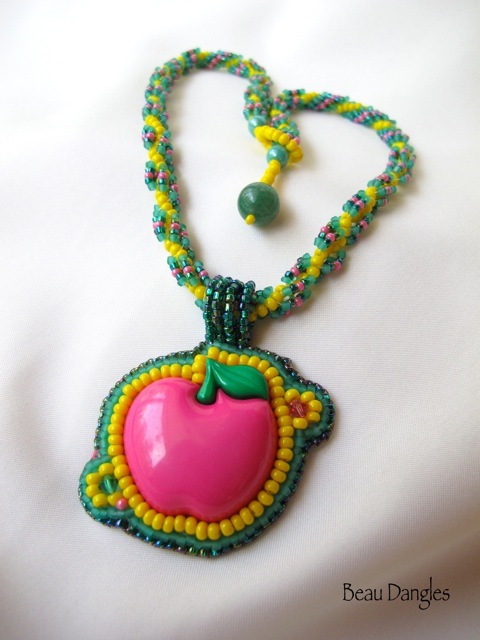 When I was beading the apple cab I needed a colour to set off the bright pink. Hmmm. After trying several options I finally resorted to a package of yellow beads. Zowie. What a neat combo. So when it came time to add a necklace strap I decided to carry the yellow theme through that as well. Good choice. Categories: Necklaces | Tags: bead embroidery, beaded clasp, beadweaving, cabachon, new, repurposed, spiral stitch | Permalink.